More details will be added as we get them. All sports clubs invited to parade on foot, in club kit to publicise the Games. Unveil the Hall of Fame, Light the Oslympic Flame, hear the anthem played by the Porthywaen Silver Band and Community Choir. Finger buffet. Clay Pigeon Shooting at Park Hall Showground. Sixth Annual Food Festival from local producers. Run-Bike-Run. Open to children of all abilities, between the ages of 8 to 14. Open to children from reception class up to year 9. Sports include: Tennis, Volleyball, Kwik Cricket, Trampolining, Swimming, Softball, Basketball and Football. Contact: Darren Hollingsworth at Oswestry School for more details. Pentathlon/Decathlon for kids, adults and family teams. Starts 6pm. Free entry. All abilities welcome. Oswestry Sub Aqua Club invites non-members to come and Have-a-Go at sub aqua diving in Oswestry Leisure Centre Pool. Book in advance to be sure of a place - Spectators welcome. from choir members or the Heritage Centre. Oslympics Open 18-hole tournament. Open to non-members, with handicap. Queens Head to Gobowen time trials. Friday evening - Registration 6.30pm. Shakespeare’s ‘The Tempest’ - Staged by the Oswestry Drama Project. Oswestry Climbing Centre - Free 15 Minute Taster sessions! 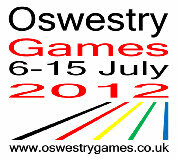 Mixed Fun Tournament 11.30 at Oswestry School Playing Fields.